Turkey's president on Saturday blamed the country's economic downturn on the United States and other nations that he claims are waging "war" against his country. 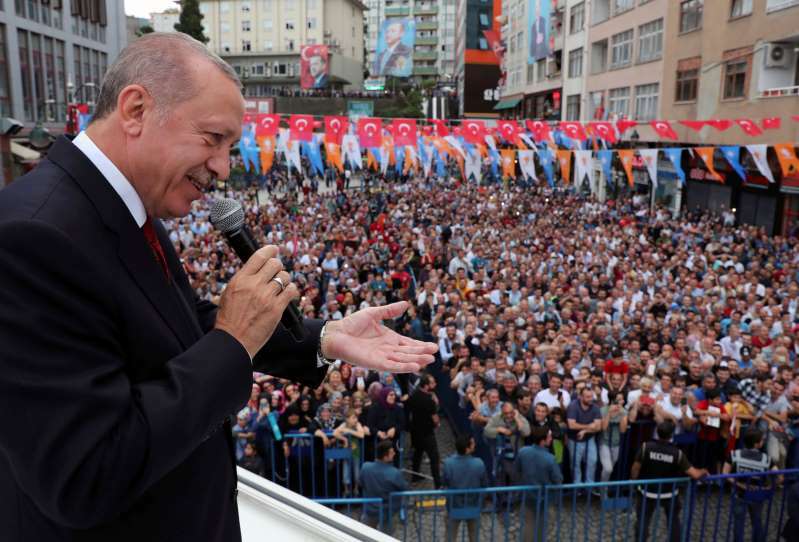 Speaking in the northeastern province of Rize, President Recep Tayyip Erdogan said that dollars, euros and gold were now "the bullets, cannonballs and missiles of the economic war being waged against our country." [post_ads]Erdogan promised supporters that Turkey was taking the necessary precautions to protect its economy but added "the most important thing is breaking the hands firing these weapons." Turkey was hit by a financial shockwave this week as its currency nosedived over concerns about the government's economic policies and a trade dispute with the United States. The lira tumbled 14 percent Friday, to 6.51 per dollar, a massive move for a currency that will make Turkish residents poorer and further erode international investors' confidence in the country. The currency drop is particularly painful for Turkey because it finances a lot of its economic growth with foreign money. The currency's drop — 41 percent so far this year — is a gauge of fear over a country coming to terms with years of high debt, international concern over Erdogan's push to amass power, and a souring in relations with allies like the U.S. In an opinion piece published in The New York Times on Friday, Erdogan criticized the tensions with the U.S., saying a "failure to reverse this trend of unilateralism and disrespect will require us to start looking for new friends and allies." President Donald Trump on Friday tweeted that he had authorized the doubling of steel and aluminum tariffs on Turkey. He said the tariffs on aluminum imports would be increased to 20 percent and those on steel to 50 percent as the Turkish lira "slides rapidly downward against our very strong Dollar!" The United States is the biggest destination for Turkish steel exports, with 11 percent of the Turkish export volume. The lira fell further after Trump's tweet. Turkey later said Erdogan had held a phone call with Russian President Vladimir Putin to discuss economic ties. It did not disclose details, but the move suggests Turkey might gravitate further from its NATO allies toward cooperation with Russia, whose relations with the West are at their lowest point since the Cold War. Erdogan has been putting pressure on Turkey's central bank to not raise interest rates in order to keep fueling economic growth. He claims higher rates lead to higher inflation — the opposite of what standard economic theory says. Amid the dispute, foreign investors could be spooked and try to pull their money out, reinforcing the currency drop and potentially leading to financial instability.